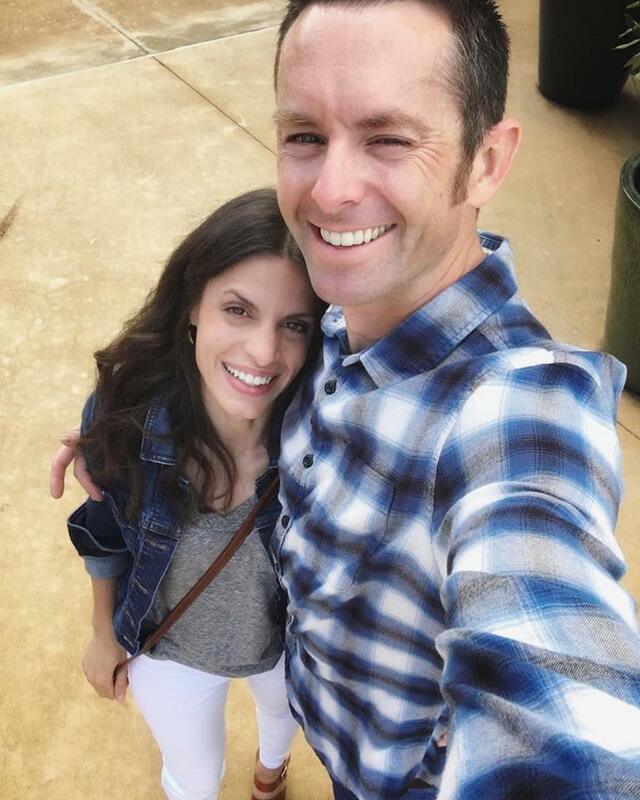 I know what you’re thinkin’… Why there?? The logical, practical place for a Christmas tree in our house is in the front room, centered on the window. There’s more room up there, plus the tree would be seen from the street, which is nice. 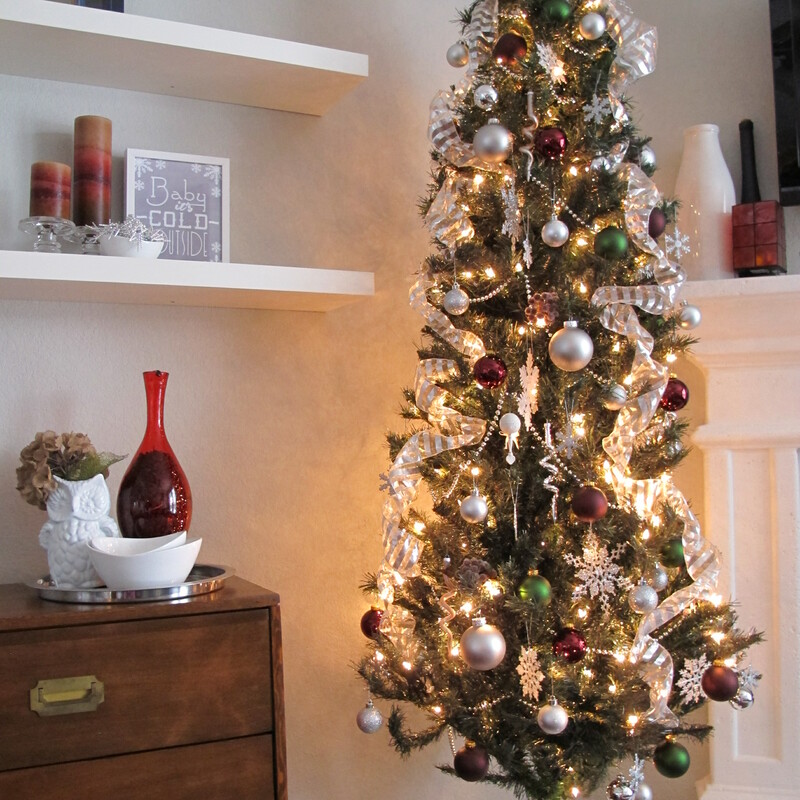 The thing is, when it comes to my (ahem, our) Christmas tree, I’m not logical. Not practical. I’m selfish. TOTally selfish. I want that sucker visible for us to admire as much as humanly (treely?) possible. And while we definitely use the front room, we’re not in it as much as the living room. So, after trying a few spots for the best placement, we settled on this. Squeezed between our media cabinet and fireplace. Visible from living room, kitchen and dining nook. It’s the first thing we see when we walk out of our bedroom in the morning. Nice. I can deal with a bit of space crampage if it means a month of sparkly tree enjoyment. For adornment, we went with a silver, burgundy and deep green theme. Partially sheer, striped silver wire ribbon simply looped down from the top. Strands of silver beads. Colored, round ornaments in various sizes. 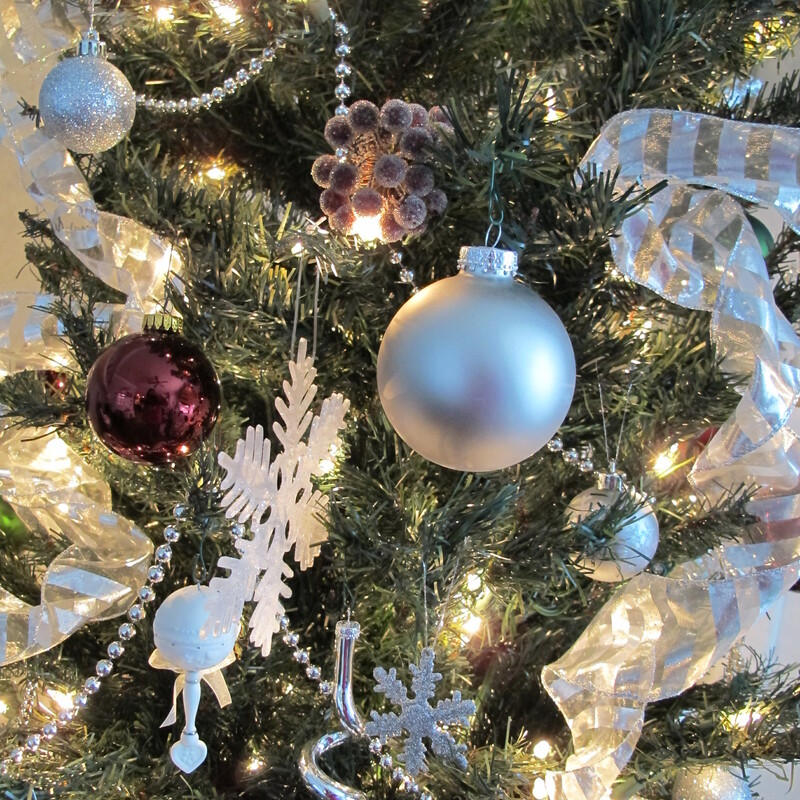 Plastic, glittery snow flakes and a few randoms to break it all up. Super simple. We have a nice tree skirt, but it didn’t mesh well with our dark floors (it’s a dark olive color that looked great with the floors in our last house, but here, not so much). So, I used an old white curtain and draped a faux sheepskin over top instead. FYI, the Santa dances. And is awesome. We need a tree topper, so I’ll have to think something up for that. We’ve gone without one for years now because I was lazy uninspired. I’m more motivated this year, so we’ll see what comes out of my crazy brain. 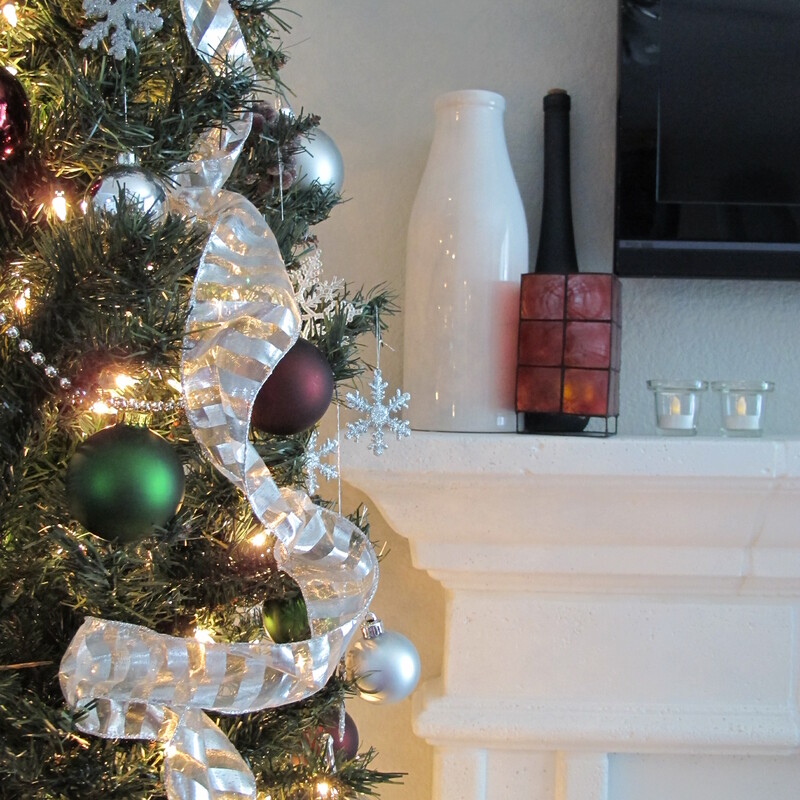 Our other tree is our Charlie Brown Tree…. Ignore the cord… it’s been too icy over here in TEXAS (right???) for me to drive to the store to get a suitable, hideable extension cord which will allow for cord camouflage. But it will happen. Anyways, doesn’t this teeny tree remind you of the spindly, little tree from A Charlie Brown Christmas??? It even has two (yes, two) blinking lights (the rest are constant), which remind me of the random enlarging/spinning stars in the sky at the end of the show when Charlie’s trying to save the tree. We originally wanted to decorate it using some wooden ornaments (made by Joey’s dad) along with some other homemade gems. So, it started out looking like this…. …Meh. The basket was a bit blah, and the ornaments were too big and too few. I decided to paint the bottom of the basket to make it pop. 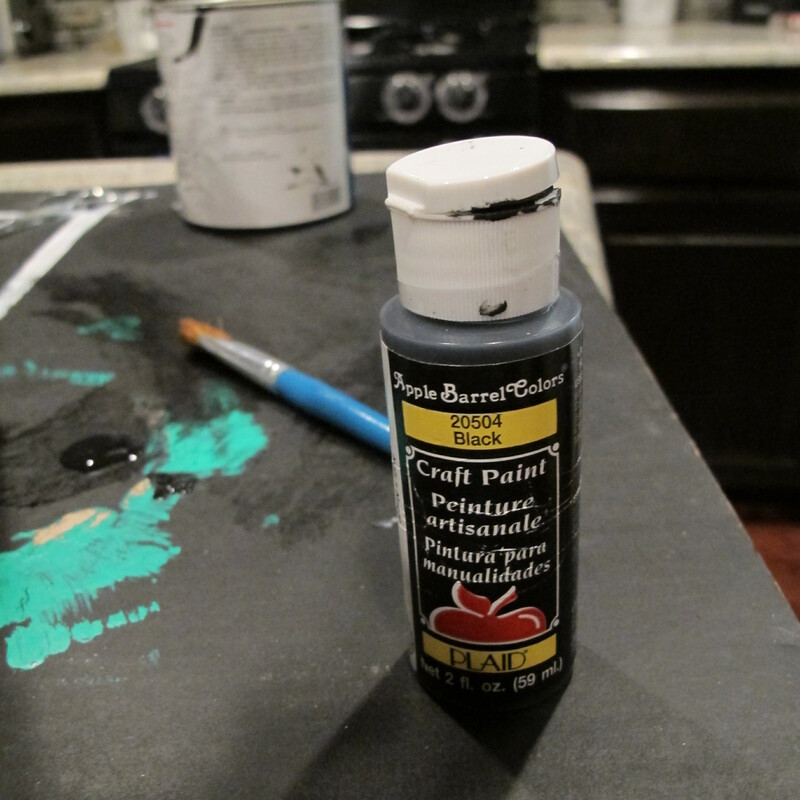 I used simple black craft paint that I’ve had for a hundred years (I’m totally channeling Dane Cook here… “I got home from work today and took, like, a Hundred Hour Nap… NO YOU DID NOT..You’d be very sick if you were taking hundred hour naps. That’s a coma, say you took a coma after work and I can follow the story!”). So, anyhoo, this paint is ancient. But it worked…. I simply chose a row on the basket roughly halfway up to use as my stopping point and free-handed the top row with a small craft brush. 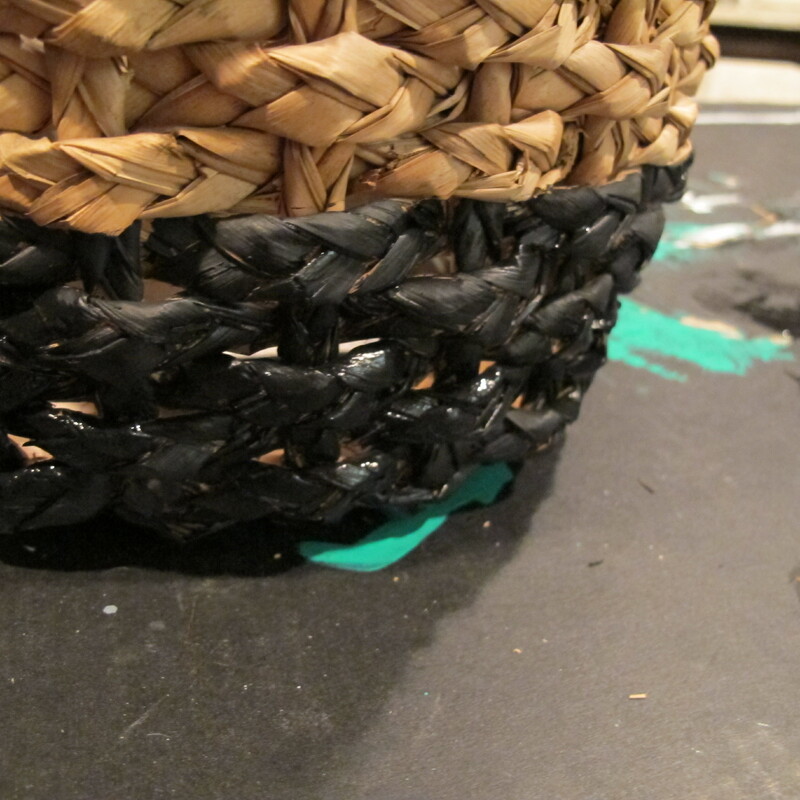 Then, I filled in the basket below with paint (sorry, no pics). In the end, it looked like this (It’s still partially wet in this pic)…. 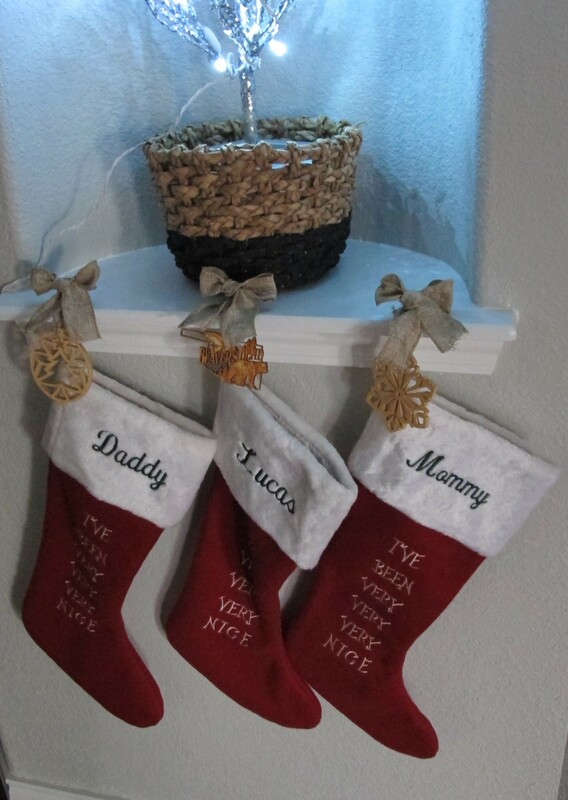 I hung three stockings that my mom embroidered for us below it. I tried them on the fireplace first, but they were GINORMOUS. Our fireplace looked like it belonged in the Keebler Elf House while they were up there. I couldn’t bear not displaying them, though, so I decided that our little hallway alcove was as good a spot as any and went for it. I used a few 3M utensil hooks to hang them. Easy peasy. 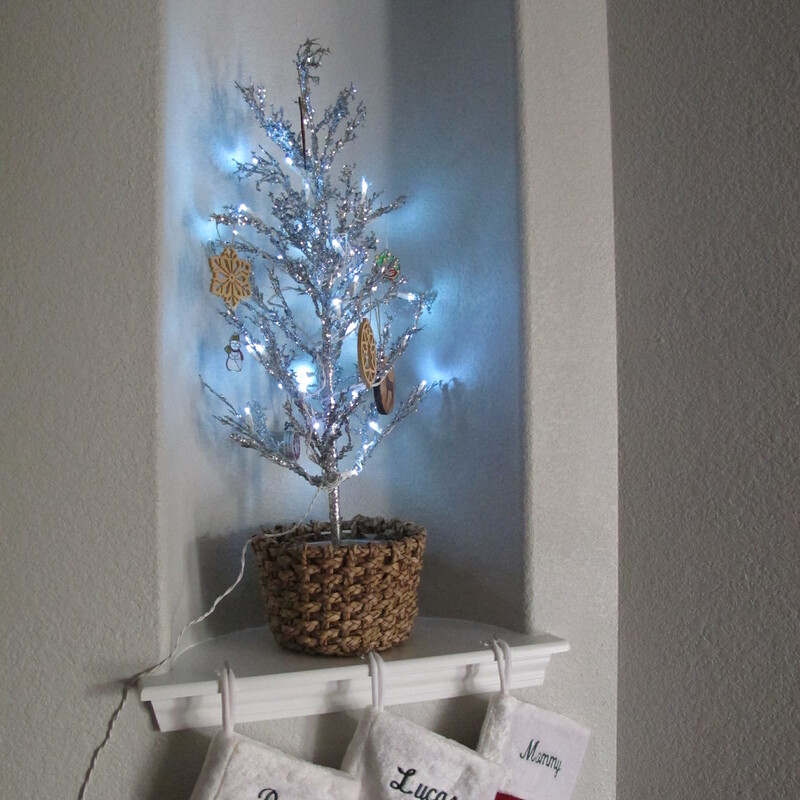 I decided to use the ornaments atop the stockings, instead of on the tree. 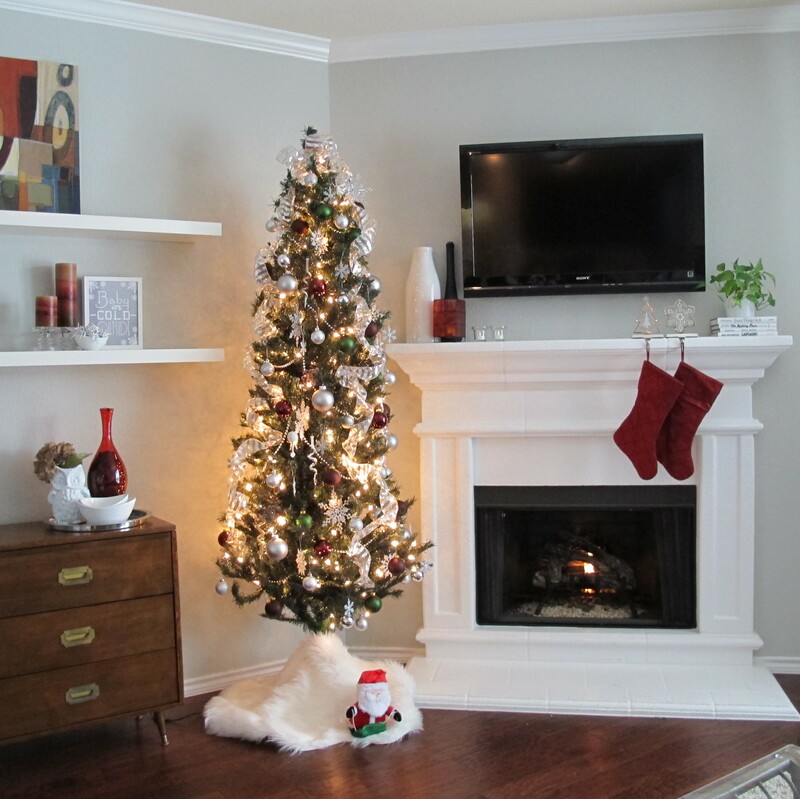 I definitely prefer the tree bare to decorated now that I see it. For sure. 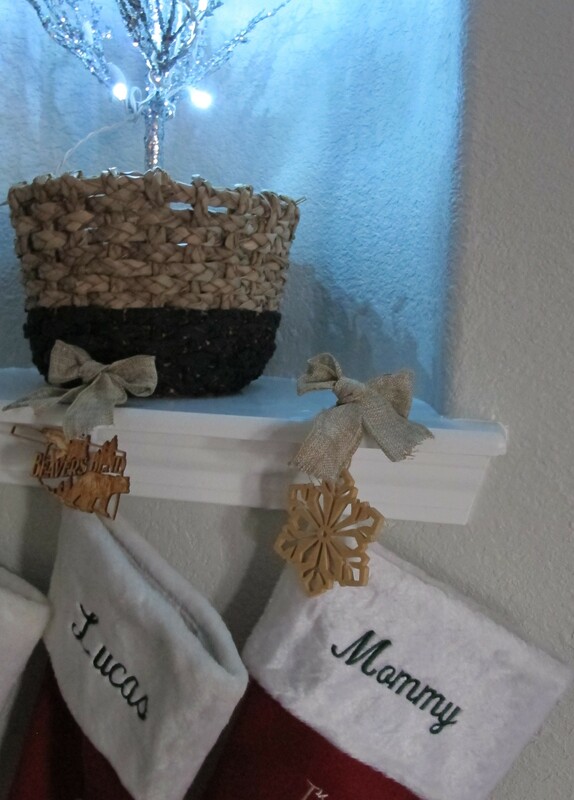 Then, I added a few burlap bows to hide the hooks (which might not stay… I’m not usually a bow person, so we’ll see if they survive the holiday season. They’re annoying me in these pics. But are strangely charming in person. So, it’s a toss up.). So, those our our trees this year. What kind of trees do y’all have this year? Very pretty and well balanced! And, I don’t think your big tree looks crowded at all. It’s like that tree was specially made for that spot? 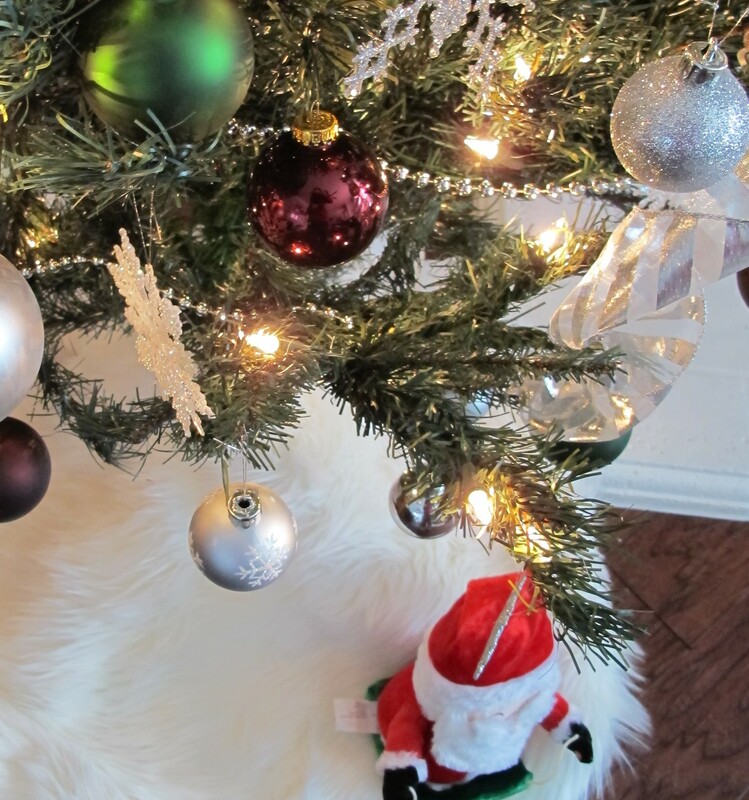 Also love the stockings with the ornaments at the top — great idea! Thanks Jesse! I appreciate that! 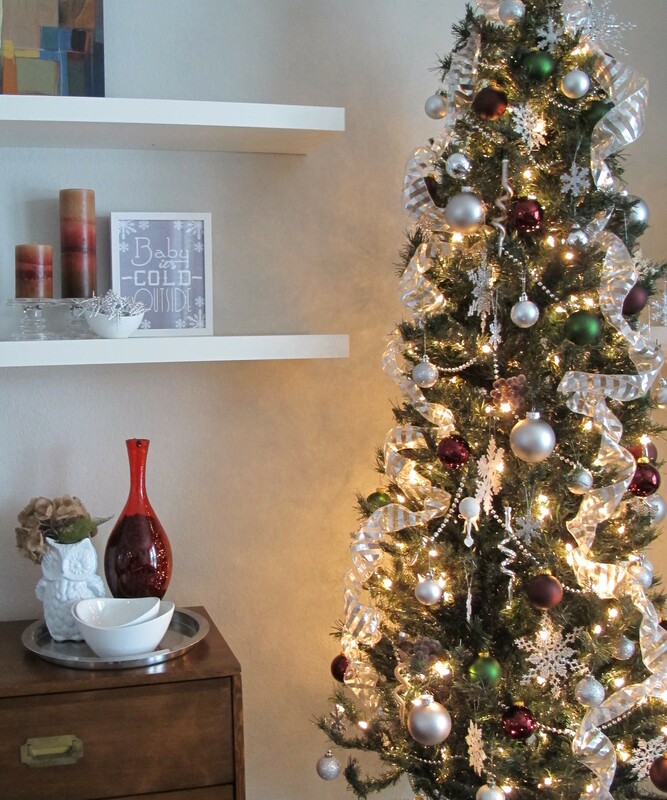 I love the ribbon on the tree…I need to do something like that since my tree just has lights and red and gold balls of different sizes. I like a simple tree, but I think mine’s a bit TOO simple. And I agree with Jesse, I can’t think of another place that would work better than where it is.